There is a mysterious, even perhaps sensual feel to glass decor. Whether it’s a table, big windows or some delicate decor details, glass makes an impression. That’s the reason why glass table tops are considered to be one of the most appealing and classy interior design options. Glass table tops are as much beautiful as they are controversial. When thinking of buying a new dining table and you are wondering if glass table is the way to go, you might be wondering is it really safe to have a seemingly so fragile furniture item in your living space. We are breaking down the essentials for you so it would be easier to figure out if a glass dining table is the way to go for you. The illusion of space and light – The main reason to choose glass over wood is the reflective nature of the material. Transparent glass mirrors the sunlight, creating a lighter, brighter and larger apperance to the room. That works especially well if the dining area is small or the room doesn’t have much natural light. A glass table top makes sure that the little that there is is played out perfectly and the room is displayed in its’ finest. They are versatile – Glass has a place in far more places than just contemporary interiors. In fact, glass table tops make for a cool DIY project – why not add a suitable table top to a wooden table, table frame made of steel or combine the table top with other materials. Glass helps to break the barriers and brings a touch of artsy interior to a vintage room. 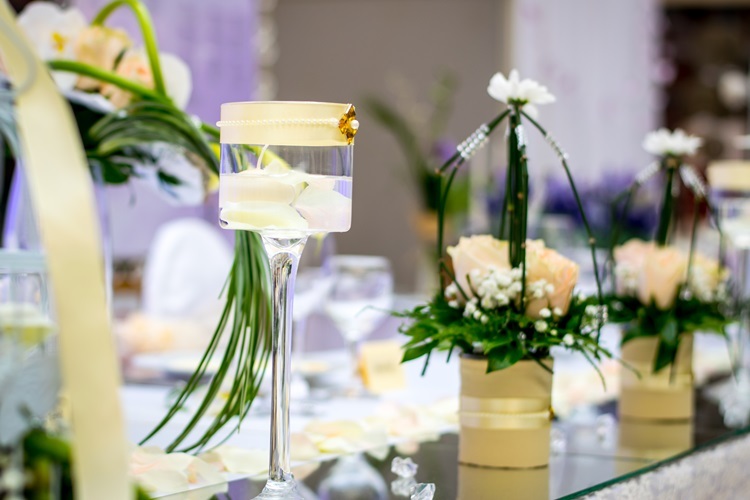 Glass helps to protect an existing table top – Glass is in fact much stronger and durable than it seems. As glass is much easier to clean and maintain than wood, it is a popular choice to add a glass table top to an existing wooden table. That way you can protect the delicate wood and create an interesting decor look with having natural wooden texture appear underneath the glass. A clash of opposites! They are easy to clean – As already mentioned in the previous point, glass is extremely easy to clean. No matter if you spilled a glass of wine or spaghetti, it’s just a matter of swiping it off! Wood on the contrary can absorb some of the spills, hence it can turn rather ugly over time. Glass table top won’t get ugly that easily! They are cheaper than wood – Glass tables tend to be cheaper than wooden tables as the manufacturing process doesn’t need so many delicate steps as wood does which needs thorough finishing. Though naturally there are very budget-friendly ways to create a wooden table as well as there are expensive glass tables, the average cost of glass is usually relatively cheaper. Why Do Glass Table Tops Shatter? Unfortunately, glass tables are not all about glitz and glam – there is a downside. There have been occasions where a glass table “explodes” – the fragments just start falling down. The good news is (yes there is a good news to glass exploding): tempered glass is designed as a “safety glass” so if this strange phenomenan should happen, the glass will shatter into tiny pieces and noone is going to get hurt. Fortunately, the chance of a tempered glass table shattering, is close to none. Some minor damage during installation – nicked edge, fasteners installed at an improper angle and other similar occasions. Binding of the glass in the frame – glass is known to expand and contract with temperature changes so if the temperature should change very suddenly, it can potentially lead to breakage. Internal defects – defects caused by some manufacturing steps, for example like nickel sulfide inclusions. Inadequate thickness – if the glass is simply poorly engineered and let’s say it’s too thin, there is a chance it cannot resist the wind load. However, today’s glass tables are no different than tables made of any other material. There are risks with any material and so is with glass but the likelihood of your table shattering into million pieces and causing harm is pretty much non-existent. How to Choose a Safe Glass Table Top? Once you’ve made up your mind on wanting to decorate your home with a beautiful glass table, it’s time to get to the next step – figuring out what you exactly need. If you know already the design you want to go for, you have narrowed it down quite a bit but there are still some specific technical details you should look for when choosing the best one. The exact thickness depends on what you plan to use the table for. However, this is a characteristic you should consider no matter the use as in case you choose too thin table top for outdoors there is a chance it may shatter in wind (even if the chance of that happening is small). The thicker the glass is, the more “luxurious” it might feel as the weight of the glass brings a certain majestic feel. A thin table top is very modern and sleek so it might be under consideration if you are looking for a dining room decor item. 1/4 – suitable for a protective cover and table tops that are under 24” in their dimensions. 3/16 – suitable for patio tables, small tables and also table covers. 3/8 – a heavier version that will work well in cases where glass is not supported. 1/2 – the heaviest version which suits the best for table tops where glass is the only material and the table top is unsupported. Tempered glass is considered to be the safety glass – a tempered glass is up to 7 times harder to break! Also, if it should happen that a tempered glass table breaks, it shatters into small pieces rather than big chunks so it can’t hurt you. Though not all glass tables are tempered – especially 1/2” ones as those are already bulky and thick – most thinner table tops are tempered to add extra strength and as tempering doesn’t really change the tables’ appearance, it is advised to go for a tempered one. There are no gambles with safety so it is better to be safe than to pick up millions of tiny glass pebbles. When shopping for glass tables, don’t forget to check the edges! 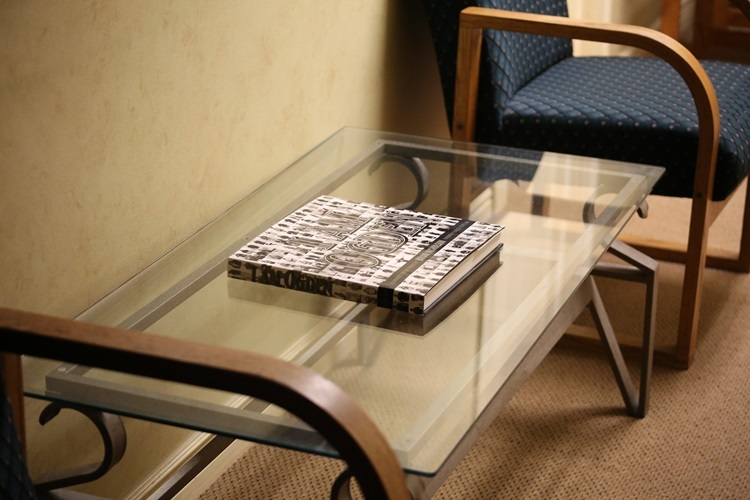 Go for a glass table that has beveled or rounded edges which are softer and don’t display any safety issues. Some older designs have still rough squared edges that are not only painful but can shatter much more easily if you should move the table around and hit a wall with the table corner accidentally. Glass is unbelievably versatile and you can find more than just regular transparent table tops on sale: there are numerous finishing touches, including different color variations. A colored glass can bring true funk to your living room while a transparent table top will contribute to the lighting in the room and will create a rafined look. This comes down to your personal taste! 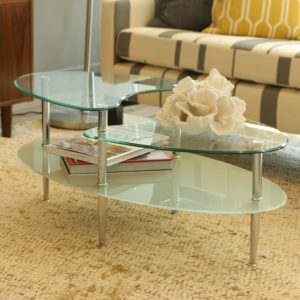 Where Can I Find Glass Table Tops? Now to the fun part – shopping! As this is a matter of personal taste, we decided to showcase 3 of our personal favourites. The choice is yours – pick one of these and add a modern touch to your home. The prism-shaped coffee table with a squared table top is hard to not notice. 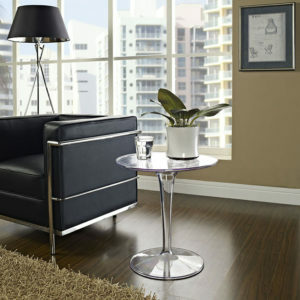 Combining metal legs with a sleek glass table top, this is a combo that will win hearts over! The table top is made of 5H thick tempered glass and the table features plastic food glides & easy-to-clean surface. Top it all, the price for such a beauty is relatively cheap & you can enjoy free shipping – YAY! You can check the table out & buy it from HERE. This modern side table leaves noone without an impression. Compact, clean-cut design makes this the perfect furniture detail for decorating your living room. Actually, this one is a bit of a “cheating” one as the table is actually constructed of plastic. However, the clear look, matte top and suitability for outdoors makes up for it and we at Zerxza just can’t help but to love this adorable item! If you’d like to add a modern touch to your home, consider this side table. You can check it out HERE! The cheapest of the three, Walker Edison oval table is romantic and adorable! Curving sparkling steel legs, beveled and tempered glass, frosted finish – these are the reasons why it is such a loveable furniture item and will decorate your home perfectly. Take a closer look at the table & purchase it from Amazon right HERE.